Fabricating custom firearms parts via direct metal laser sintering machines is a design solution that offers flexibility, cost efficiency, and design freedom. This rapid prototyping process allows small arms manufacturers to build and test custom firearms and firearms components. i3D MFG, a 3D metal printing company, provides DMLS/DMLM services to help manufacturers test out new designs within days or weeks rather than months or years. Our direct metal laser sintering machines fabricate components made from rare materials, such as Inconel, maraging (tool) steel, and titanium. These metals ensure optimal strength and handling for tactical firearms components. Our heat treat process provides additional strength and durability; for example, maraging steel hardens to an average of HRC 53. 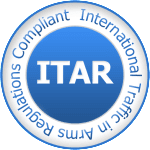 Our 3D metal printing company is ITAR-registered with the U.S. Department of state. i3D MFG follows ITAR protocols in our Bend, Oregon and The Dalles, Oregon locations.